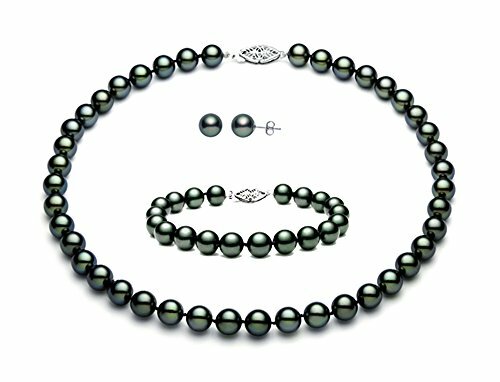 This gorgeous set of black peacock Freshwater cultured pearls includes a necklace, a bracelet and a pair of matching earrings. The necklace is 17" and the bracelet is 7". They are knotted in-between each cultured pearl and finished with a beautiful sterling silver clasp. These cultured pearls are extra fine AAA quality, with high luster and clean surface. They are dyed black with beautiful peacock green overtones for an eye-catching look. This jewelry is hand made by our skilled jewelers in USA and quality controlled strictly by our cultured pearl experts. It comes with a high quality jewelry box and a certificate of authenticity. This gorgeous set of black peacock Freshwater cultured pearls makes a perfect gift for her. They are extra fine AAA quality, with high luster and clean surface.